Just as in the rest of the nation, kids in Spokane can't do math. How do we solve that problem? 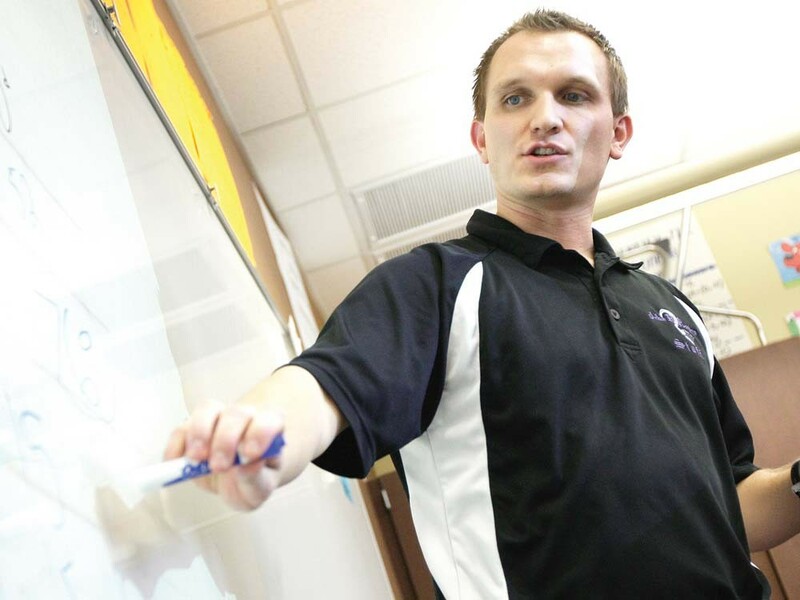 Rogers High School teacher Joe Schultheis knows the stakes: Last year at Rogers, less than a quarter of sophomores passed the state standardized math test — the one once touted as a graduation requirement. And Rogers has company. Less than a third of North Central high schoolers passed the same test. For the district as a whole? Only 39 percent. That was one of many figures scrawled on the whiteboard in the Shadle Park Library on Monday night. Nearly 75 people — a quarter of them district administrators — gathered for a community forum peppered with interruptions, yelling, sarcasm, derisive laughter and audible groans. Education advocate Laurie Rogers, the host of the meeting, had written a 250-page manifesto called “Betrayed: How the Education Establishment Betrayed America and What You Can do About It.” She had to expect her beliefs that the math curriculum is a “willful obstruction of our children’s learning” would be controversial. Here’s how you probably learned math: The teacher explained the right method to do long division, and you used it to finish hundreds of problems. But after only about 80 percent of seventh-graders failed the first explain-your-answers WASL test in 1998, something had to change, says Tammy Campbell, director of Teaching and Learning Services. Enter new standards, new textbooks, and a new philosophy. Now, Campbell explains, teachers may teach several possible methods to come to the same answer — and often won’t teach the traditional most-efficient methods first. Sometimes they’ll let students search, by themselves or in groups, for their own methods. On the whiteboard at Monday’s forum, a young elementary school student showed the method he figured out for long division. It’s not traditional — he subtracts chunks of common multiples from the total — but he eventually arrives at the correct answer. William Little, a Garfield Elementary “Math Is Cool” coach, however, testified at the forum that he’s witnessed a student in tears over attempting to multiply 30 and 22 by a non-traditional method — by adding 30 22 times. On the very last sum, the student made a mistake, and got the wrong answer. Rogers believes the methodology confuses children and doesn’t prepare them for the more complicated operations. Campbell believes the struggle creates stronger students, who actually understand the math behind the math. Interrupting and then correcting one another, each cites piles of research to back up her side. The fight between Rogers and Campbell is just a small battle in a war that educators have waged for 22 years. That inconsistency drives math teachers crazy. “This is the fifth curriculum that our teachers have been teaching in seven years,” North Central Principal Steven Gering says. In 2007, to align with state standards, schools ditched the Integrated program for the reform-math Core Plus textbook series. Teachers were encouraged never to give students the answer, Schultheis says. Students learned tenacity and problem-solving skills. “But they couldn’t solve equations,” Schultheis says. In 2009, to align with state standards, Core Plus was replaced by Holt Mathematics, the sort of traditional curriculum that Laurie Rogers appreciates. But she says it’s been “virtually destroyed by the district administration.” Teachers don’t go page by page. They skip around to different chapters. They augment the textbook with extra hands-on activities. Schultheis, like many math teachers, believes this balance is a good thing. “What is the purpose of my class?” Schultheis says. “Is it to teach students geometry or is to teach students to be lifelong learners and teach the skills to persevere and be a problem-solver?” He chose the latter. But it’s hard to tell which textbook improves his student’s test scores, when the tests change so often. This year comes a new assessment — end-of-course evaluations instead of comprehensive standardized tests. And in a few years, the curriculum will change again, to align with new national standards. Curriculum, of course, isn’t the only theory concerning why Spokane Schools struggles with math. Other districts, like Issaquah and Bellevue, use similar textbooks and have incredible test scores. But there’s a major difference: Those districts are rich. Bellevue has less than half — and Issaquah less than a sixth — of the number of students qualifying for free or reduced lunch as Spokane does. (In Spokane, the poorest schools have the worst 10th-grade math scores). Chris Barron with the Office of the State Superintendent says that, across the state, districts similar to Spokane have similar or worse math scores. Changing poverty, of course, isn’t as easy as changing textbooks. But the Spokane School District is using other strategies: Despite tight funding in the district, North Central Principal Steven Gering says there are two fully certified math teachers assigned to each NC classroom. Teachers are trained with extra skills. Instructional coaches help tutor kids. Students in groups help teach each other. “Those numbers,” Campbell says of the math scores. “are not OK.” It’s just a matter of figuring out how to fix them.